More sketches from looking at Byzantine pictures. 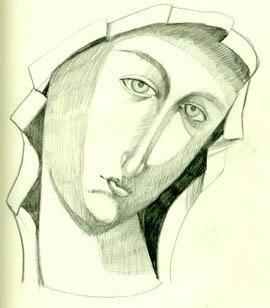 They really crowd the features of the face into the center of the head, stretch and thin the nose, stylize the chiroscuro, and make the gestures wooden. Tiny little mouths.No teeth, ever. Lots of hair for the boys. Poor Mary. Always with some sort of headdress with these almost typographic folds. Her clothes are always made of the same material...sheet metal. Often times, her Byzantine clothes are ruby red with embroidered stars on the head, shoulders. Love the inset lettering shown in these icons.